Colonial Candle Oval Jars - 22 oz. Colonial Candle Oval Jars - 8 oz. Keep your family holiday traditions alive with a 12" Handipt Advent Candle set. Please note that this set includes the candles only, not the taper holder or decoration. Perfect for entertaining and weddings. 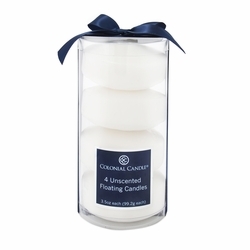 Unscented white floating candles.